Avail affordable services for Shopify ecommerce development in Dubai: Enhance your store today! With a majority of traders selling their products online, e-commerce has become the raging business trend today. It is important to build an e-commerce store to meet the rising demands of the customers. Irrespective of the size of your business, it is essential for you to make the right choice of a platform for e-commerce development store which excels in all respects. Shopify is among the best e-commerce platforms with excellent professional themes and premium features. Although it is simple, it consists of a blogging platform which helps the customers. Are you thinking to start or upgrade your e-commerce store? Facing difficulty in establishing it? Relax! Contact our experts for unmatched Shopify ecommerce development services. We are ready to help you out in the best possible way. You can easily use it and setting it up is not a complicated process as the platform itself offers the software and hosting which is necessary for launching a website. With unique creation, it is a visually appealing online store. It can be easily integrated with applications ie. you can add some extra features to your store. It has a reliable infrastructure which provides the platform with a superfast speed. Need services for Shopify ecommerce development in Dubai? Contact our experts at Tech Support Dubai . With our assistance, you can develop your e-commerce store in an appropriate manner. 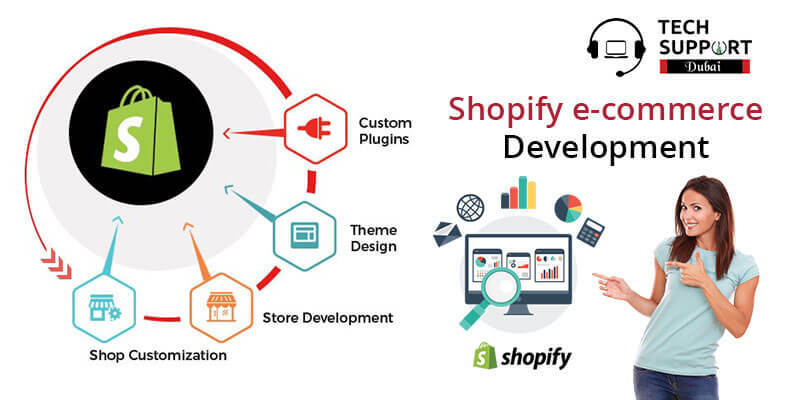 We, at Tech Support Dubai assure you of services for Shopify e-commerce development at your doorstep. Our team consists of developers who are trained in dealing with the latest technology and hence we deliver you with the most appropriate solutions. Let us know about your requirements and get a perfect solution from us. We meet the focused requests of your business by using creative ways. If you are worried about our performance, we advise you not to, as we use the finest resources to meet your purpose. Besides, we make sure of the fact that your store is visually appealing and functions smoothly. We ensure that the designed theme is compatible with your business and it functions on all the mobile devices and browsers. The specialty of our team is that we customize your e-commerce stores and make sure that your business objective is achieved. Be it development, deployment or upgrade, we provide you with the same. If you want to create your online store, Shopify ecommerce Development Company in Dubai is your ideal choice. Want to make your online store attractive? Need professional Shopify eCommerce Development services? Do not panic; call us at our helpline number. In case you are unable to reach us, do not fail to drop an email. Trust our services and stay in touch. We also provide API integration service in Dubai.